The question investors keep asking is what can Apple (NASDAQ:AAPL) do to regain investor confidence? Those writing articles about the company don’t seem to be able to agree on whether the past earnings report was a positive or a negative. If we look at some comments from the company’s conference call, Apple seems to have at least one answer to what’s next. The company is attempting to return the iPhone business to growth while continuing to grow its services business. Ironically, Apple can achieve both goals by taking business from wireless carriers. Did Apple take a step forward or backward? The confusion around Apple’s earnings is easy to find. Looking at recent headlines, it’s no surprise that investors can’t figure out who to believe. It’s difficult to digest a headline suggesting the company is no longer just a hardware company when 87% of Apple’s revenue came from products. The size of decline in iPhone sales more than offset other product gains, as products revenue declined by more than 7%. In addition, the transition away from more profitable products caused Apple’s « Products » gross margin to decline from over 36% last year to just over 34% this year. Clearly, Apple needs to improve its products performance. If the Services business is the future of Apple, this division couldn’t have done much better. 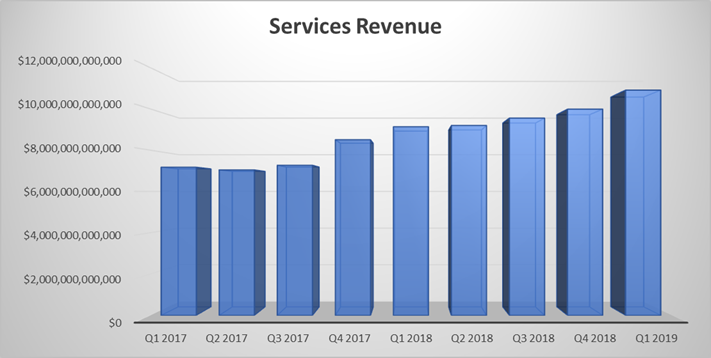 There was some confusion about the growth rate of the Services division, yet a year-to-year comparison is very straightforward. With an adjustment to Services revenue from last year, the business grew revenue at around 17% annually. Without this adjustment, Services came in at $10.9 billion this year compared to $9.1 billion last year, a 19.1% growth rate. This is an important distinction as it appears Services revenue is re-accelerating. Though Apple’s revenue was a bit of a mixed bag, cash tells a somewhat different story. If we look at the company’s core cash flow (net income + depreciation), this measure increased by 2.6% year-over-year. In addition, net cash and investments increased by 6% year-over-year. With many questions still facing Apple, the company’s next step faces a mix of risk and huge potential rewards. Cook also suggested that the lack of subsidies was a challenge facing the company’s iPhone business. It was an interesting comment, as traditional subsidies at least in the U.S. have been gone for some time. The current proposition is to have customers trade-in their existing phone for a discount on their new phone. To make the cost palpable, carriers have provided equipment financing normally splitting the cost over a 24-month period. At present, Verizon Wireless (NYSE:VZ) is offering customers $215 as their trade-in value for an iPhone 7. In addition, existing customers get $100 off the price for upgrades. If the customer is switching from another carrier, instead of the $100 discount, they get $300. According to Apple, the most popular iPhone presently is the iPhone XR priced at $749. If a customer trades in their iPhone 7 and is switching carriers, the bottom-line price for Verizon would be $234. With a 24-month financing agreement, the customer would pay about $10 per month. T-Mobile (NASDAQ:TMUS) has a similar and aggressive offering for the iPhone XR. At present, trading an iPhone 7, 7 Plus, Galaxy S8, or others gets a customer a $390 discount. This discount is applied over the financing contract. T-Mobile has also stretched out the cost equation by offering 36-month financing. If a customer takes advantage of this offering and spreads the cost over 36 months, they could end up paying just $10 a month for one of the latest iPhones. The risk to Apple is clear. If wireless carriers can’t convince customers to upgrade with aggressive options, how can Apple hope to get its significant iPhone business back on track? Why would this matter to wireless carriers? Wireless customers are already free from the old school two-year service contract. However, equipment financing keeps users tied to their carrier and makes it difficult to change without paying off the debt. The offers toward the cost of new phones are less about reducing the cost of the new device and more about offsetting the financing they are trying to get away from. Apple has a chance to change this dynamic, and wireless carriers should be very concerned. In the last quarter, Verizon’s wireless revenue increased by less than 3%, yet the split of this revenue growth is telling. Retail postpaid connections increased by 2.3% on a year-over-year basis. By comparison, Verizon’s equipment revenue of $6.8 billion increased by over 5% annually. This has been the trend with Verizon for the last several quarters. The company’s services revenue has been growing at a slow rate, while equipment revenue drives larger top-line growth. Looking at T-Mobile, we see the same trend playing out. In the company’s last quarter, Postpaid revenue increased by just over 6%, while equipment revenue of $2.4 billion increased by 13% annually. In a similar manner to Verizon, T-Mobile’s equipment revenue growth has been consistently outpacing service revenue. The big question of what’s next may be answered with a change in how customers think of the iPhone. It’s no coincidence that since Apple’s last conference call, the company has been advertising in multiple ways about its trade-in program for the iPhone. If customers can break away from trading in their phone through Verizon, T-Mobile, or other carriers, they can effectively take their equipment to any carrier. The service of buying an iPhone from Apple directly already exists, yet the company is beginning to refine this offering. The current program is the iPhone Upgrade Program. This service allows users to get a new iPhone each year, includes AppleCare+, works with any carrier, and spreads the payments over time. What has been largely missing is the trade-in value that is being advertised with ferocity. At present, Apple is offering $150 for an iPhone 6, $250 for an iPhone 7, and $300 for the iPhone 8, just as a few examples. To put numbers to the option, I have an iPhone 7 and let’s say I’m interested in the iPhone XR. My trade-in is worth $250, the original cost of the XR is $749. The bottom-line cost would be $499. If Apple lets me spread this cost over a 24-month period, the monthly cost would be $20.79. We can see that almost $21 per month is a challenging option for a customer who could pay about half that through different carriers. However, there are levers that Apple can pull to change the bargain. First, the company has « more than 50 million paid subscribers » of Apple Music. This service is growing nicely and is priced at between $4.99 per month for students, up to $14.99 for a family plan. Apple is also seeing significant growth in wearables, as Tim Cook said, this revenue was up 50% year-over-year. The company is also expected to launch new AirPods this year and some analysts are expecting over 100 million units to be sold per year by 2021. Given the popularity of AirPods, the significant growth of Apple Music, and the need to find a growth driver for the iPhone, the solution seems obvious. Apple needs to leverage one of its most popular services and device as a bundle to push iPhone sales. An option to finance a bundle of a new iPhone, AirPods, and Apple Music, at a discounted price would be a significant value to customers. At present, an iPhone XR costs $749, AirPods cost $159, and Apple Music runs $14.99. If we look at a two-year cost of all three, this comes to $1,267.76. If we stick with this pricing, the consumer would pay nearly $53 per month over 24 months for the bundle. That being said, Apple’s margin consideration should allow for a significant discount. According to reports, Apple generates about a 60% margin on the iPhone on average. AirPod margins are near impossible to find but priced at $159, it’s difficult to believe Apple’s margin could be more than the iPhone. For argument’s sake, let’s assume a 50% margin. Apple Music is a different beast, as the company is estimated to generate a 15% to 20% gross margin on this business. Bundling these devices into a package that customers might jump at would likely require a lower overall price. If Apple’s intention is to return the iPhone business to growth, AirPods and Apple Music would seem to be two solid drivers to push for new sales and upgrades. At present, it seems customers are hesitant to pay $1,000 or more just for the iPhone, but something close to this price might work for the bundle. A selling price of $1,100 financed over 24 months would equal roughly $46 per month. Let’s look at how the bottom-line numbers fare if we assume this bundle generates a 15% increase in iPhone sales. As we can see, a 15% increase in iPhone sales driven by the inclusion of AirPods and Apple Music would benefit Apple significantly. The company would generate a slightly lower gross profit per bundle, yet, Apple would be able to return its largest revenue driver to growth. Given that Apple would be financing this bundle over a two-year period, the company could account for these sales as subscription revenue. This would have a significant positive effect on Apple’s results. Spreading this revenue over time would help to smooth out the company’s ebb and flow of revenue as customers replace their existing phones. With net cash and investments still exceeding $130 billion and three-month core free cash flow of more than $23 billion last quarter, Apple can clearly afford this financing option. Since the devices wouldn’t be tied to any carrier, customers would gain flexibility they don’t currently have. The bottom line is if Apple wants to drive iPhone sales, leveraging AirPods and Apple Music could be the next big thing investors are looking for. Disclosure: I am/we are long AAPL, VZ. I wrote this article myself, and it expresses my own opinions. I am not receiving compensation for it (other than from Seeking Alpha). I have no business relationship with any company whose stock is mentioned in this article.